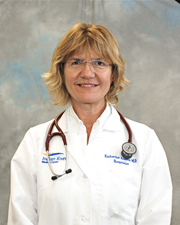 Dr. Katherine Adams is an Internal Medicine Hospitalist who earned her medical degree at Poznan University of Medical Sciences in Poland. Dr. Adams subsequently performed her residency at St. John Hospital & Medical Center in Detroit, Michigan and completed her fellowship at the William Beaumont Hospital in Royal Oak, Michigan. Dr. Adams is board certified in both Internal Medicine and Geriatric Medicine.